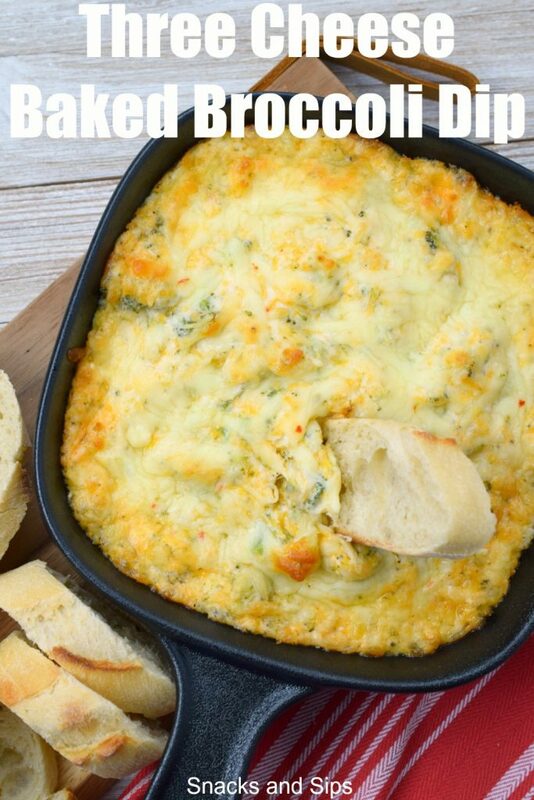 Three Cheese Baked Broccoli Dip is the perfect dip for parties! 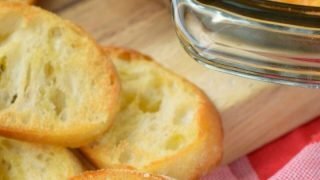 Easy to make, this appetizer has a great variety of flavors. You’ll love it! 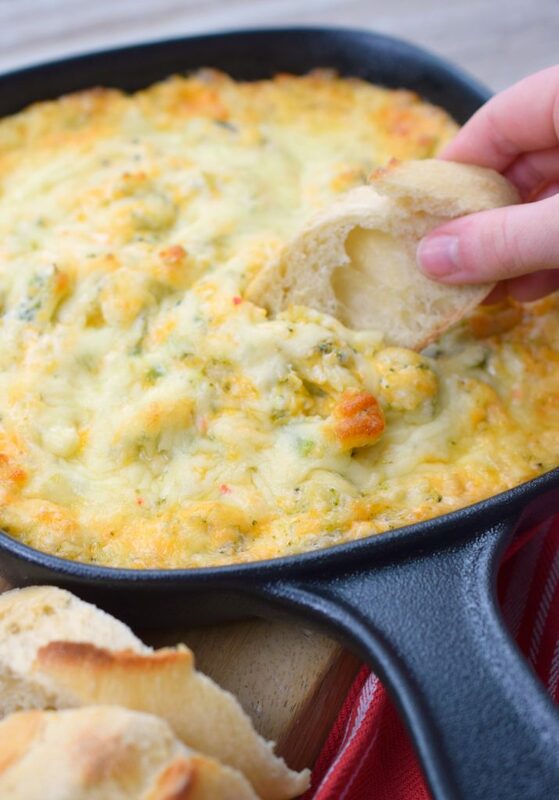 Friends I’ve been meaning to make this Three Cheese Baked Broccoli Dip for weeks and share on the blog. And well, it just wasn’t happening, until now. Originally I was thinking I’d get it published in mid-January prior to the big dip push for Super Bowl parties. Nope, that wasn’t in the cards. But hey, as they say, “better late than never”, right? You’ve probably also heard the statement “some of the best things in life are worth waiting for”, and this dip is definitely the case. Worth the wait and oh so good! Why are dips just so good? 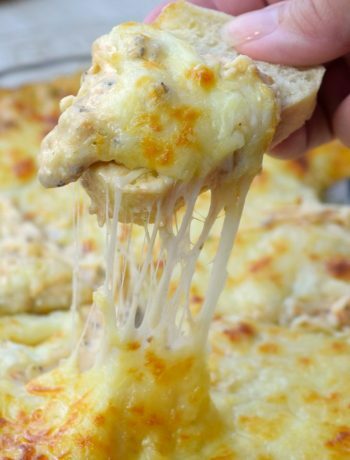 One word: cheesy-goodness. 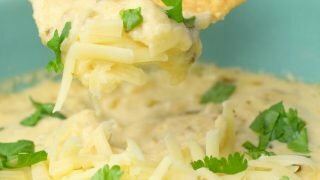 Okay that might be two, but boy oh boy I do love a good cheesy dip. 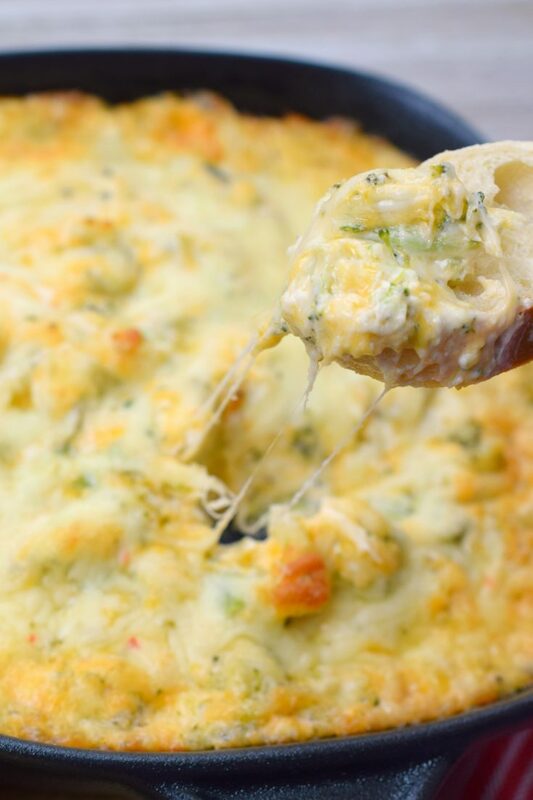 Three Cheese Baked Broccoli Dip doesn’t disappoint. With three different cheeses, you know this is gonna be a keeper. 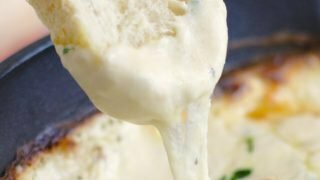 Comforting dips to me are ones that are ooey-gooey with cheese and have the dipability factor. Is that a real thing? Truly I’m not sure, but in my world, there is a dipability factor…it just means the dip is extra yummy! If you love broccoli, perfect! Make the dip it won’t disappoint. If you aren’t a huge fan of broccoli, let me reassure you that this dip doesn’t have an overpowering broccoli flavor. The broccoli flavor is subtle amongst all that cheesy goodness. What I really like about this dip is how simple it is to prepare. 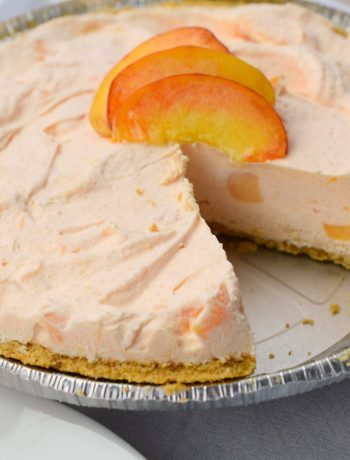 You can whip this up for last minute entertaining, no worries it is really easy to make. The recipe uses frozen broccoli florets, which are thawed, microwaved and chopped. Next comes the cheese and seasonings, it all gets mixed together and combined with the broccoli. Next, you spread the mixture into a baking dish. Pop the dish into the oven and bake until lightly browned on top and all that goodness is melted together. 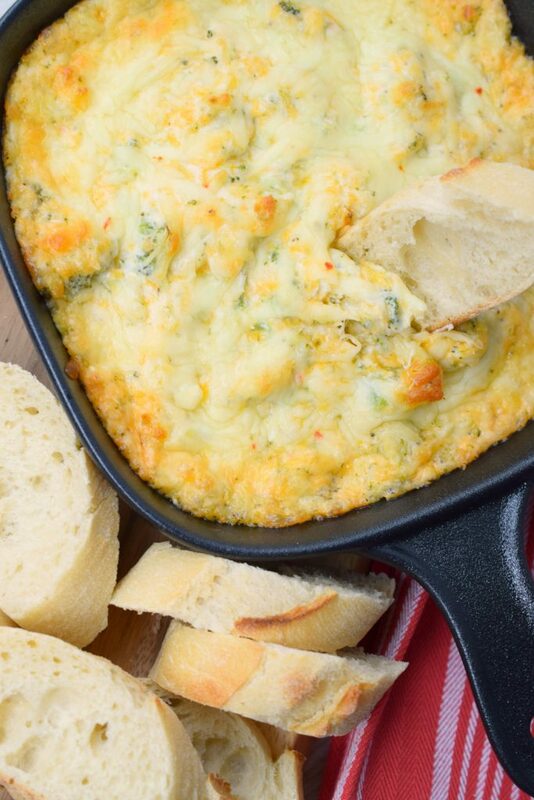 What do you need to make Three Cheese Baked Broccoli Dip? 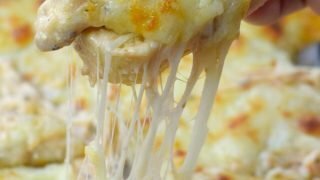 Some tips for making Three Cheese Broccoli Dip? Blot cooked broccoli with paper towels if it is too wet after microwaving. Like things spicy? Add additional Red Pepper flakes or add a dash of Tabasco sauce. Serve with sliced baguette slices, Triscuits or bagel chips. Reheats well in the microwave. More Delicious Dips to Make! For parties, holidays, tailgating and everyday occasions. We have a dip that you'll love, check these out! Lasagna Dip - A quick and easy appetizer recipe perfect for a party! All of your favorite lasagna flavors in an addictive dip recipe! Slow Cooker Four Cheese Queso Dip is always a hit for parties, tailgating, or holiday events. Easy to make, you'll love this appetizer from your crockpot. Classy Bacon Cheddar Dip | Who Needs A Cape? 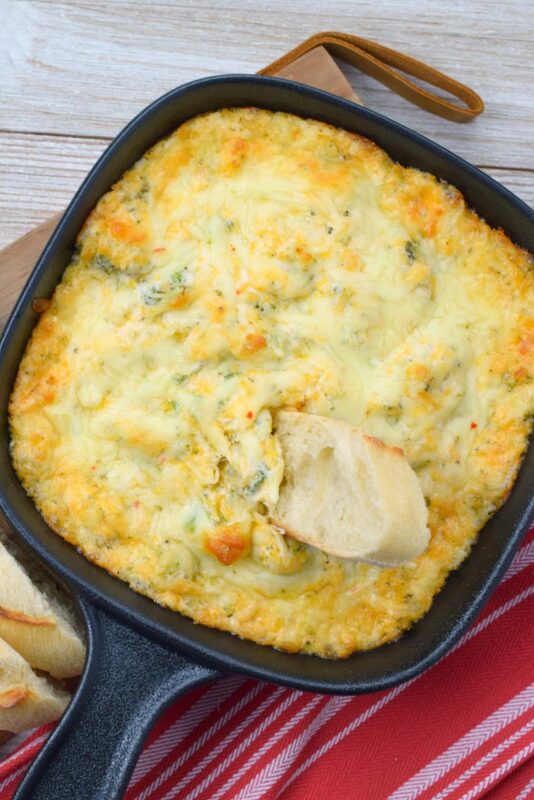 Three Cheese Baked Broccoli Dip is the perfect dip for parties! 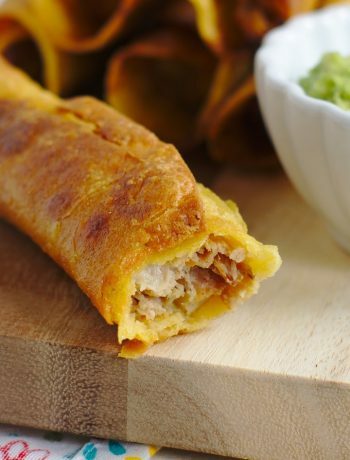 Easy to make, this appetizer has a great variety of flavors. You'll love it! Steam broccoli according to package direction in microwave. Allow to cool. Once broccoli has cooled, chop into small pieces. With electric mixer blend cream cheese until smooth. Add in mayonnaise and sour cream, blend with mixer until combined. Add in Sharp Cheddar cheese, 1 cup of Pepper Jack cheese, garlic powder, and Red Pepper flakes. Blend with mixer. Add in chopped broccoli and blend again. Spread mixture into baking dish. Top with remaining Pepper Jack cheese. Bake approximately 25 minutes until lightly browned on top.